Nonprofits and activists often find themselves in the position of responding to disasters heaped upon slower moving injustices. This quandary is distressingly evident in stateside organizers’ work to address the problems in Puerto Rico post-Maria. By now, most of us have heard the numbers on the humanitarian crisis in Puerto Rico resulting from Hurricane Maria, a Category 4 storm that directly hit on September 20th, its eye covering the entire the island. But the island’s emergency started long before the storm hit, and some advocates are suggesting this is a moment when serious investment in the so-called territory’s future is in order. Places like Puerto Rico also provide important economic cover for their colonial centers. Cheaper labor pools, lax environmental protections and economic loopholes make them attractive sites for speculative investment, money laundering and tax evasion. Indeed, it was Puerto Rico’s unique ability to issue triple tax-exempt bonds—subject to neither state, federal nor municipal tax—which made it so irresistible to U.S. investors, leading in no small part to the current crisis. This rebuilding period could be a chance to holistically rethink Puerto Rico’s resiliency infrastructure, taking a cue from some of the lessons learned (or bungled) in New York and New Orleans after Hurricanes Sandy and Katrina. Judith Enck, the former EPA administrator for Region 2, which includes Puerto Rico and the U.S. Virgin Islands, says, “It’s absolutely imperative that FEMA not fund rebuilding an inadequate system.” Puerto Rico’s energy infrastructure relied on coal and oil, “unreliable and unsustainable power sources.” Its residents paid some of the highest rates in the country for that energy. Meanwhile, in the midst of all of these longer term concerns, many local organizers are busy trying to manage immediate relief efforts. NPQ talked to stateside Puerto Rican leaders about what they were hearing and doing. We are learning that, as with many other challenges, local leaders are stepping in to do what the federal government will not. Roman is co-chair of the Western Mass United for Puerto Rico Coalition, comprising politicians, nonprofit leaders, and community stakeholders. He described the coalition’s three-pronged strategy. We are collecting goods for now, but, after the 1st or 2nd of October, we’re shifting the focus to financing, or sending money to the island. The money will be there before the goods and services. When the goods hit the island, only FEMA can release them and that takes days. The last component is the migration of Puerto Ricans coming to stay with their friends and family, either in transition or to stay permanently. We as a community are having a strategic conversation with the school system to relieve immunization and identification requirements so children from Puerto Rico can get into schools right away. We’re also coordinating with nonprofits so that they can handle the needs of these individuals. The coalition has a counterpart in Connecticut led by Jason Ortiz, also of National Puerto Rican Agenda. Eastern, Massachusetts started its own coalition last week with an inaugural meeting at Inquilinos Boricuas en Acción (Puerto Rican Tenants in Action). This situation has a unique impact in Massachusetts. Holyoke has the highest concentration of Puerto Ricans in the U.S. and the fastest growing among people of color. So, we were already checked into this. The irony is that, as a community of Puerto Ricans, we’re not usually this coordinated. This is unprecedented for Western Massachusetts. We’re not just having meetings; we’re inventorying relief efforts, bringing communities together to raise money. We’re meeting tomorrow to coordinate the state’s response to health care, child care, food access, housing, elderly care, education, language. We’re already at that stage because some Puerto Ricans are already bringing family back. At first, the only way to get things in was through the military. But to do that, you have to go through an application process. The only organization I know in the state or the region that applied was Nueva Esperanza. We did that just in case nothing else worked out. If there’s commercial availability, we’d pursue that. The government can’t say no to commercial entities. So, we started to listen to who was willing. JetBlue just got approval from FEMA to fly, so we introduce them to organizations in that area trying to move materials in as they fly people out. Some people are going there to get family. I have a friend who flew out yesterday to get his mother out. We have members who have partnerships with local municipalities which are helping us to get money in. One coalition member used to work for a mayor in Puerto Rico. Most likely, the Puerto Rican counterpart will designate a bank to which we send the money, and they would distribute the funds locally. Finally, we’re getting ready for the refugees, migrants, emigrants…I don’t know what they’d call them. They’re probably going to the cities with the largest Puerto Rican populations: Chicago, Springfield, Boston, Hartford, New York, and Florida. We’re turning to how to coordinate between governments and nonprofits on dealing with the influx, which will be adding an extra economic burden to families that may already be limited. The next step is figuring out how to make sure it’s funded appropriately. There are going to be more extreme weather events. Climate change is here. There’s no denying that. This is going to happen harder and faster, so any rebuild has to be sustainable and regenerative. The entire economy has to be built in regenerative energy and local economic livability.…How do we keep an eye on the rebuild so we don’t end up in a worse station for our sovereignty? This is a shakedown, a mob protection racket, with Puerto Rico a captive market. The island is the fifth-largest market in the world for American products, and there are more Walmarts and Walgreens per square mile in Puerto Rico than anywhere else on the planet. 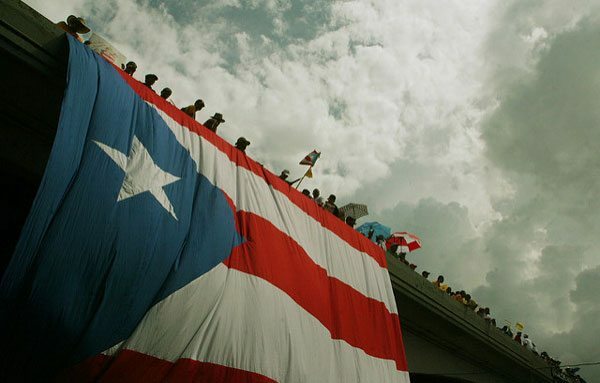 A 2012 report by two University of Puerto Rico economists found that the Jones Act caused a $17 billion loss to the island’s economy from 1990 through 2010. Other studies have estimated the Jones Act’s damage to Puerto Rico, Hawaii and Alaska to be $2.8 billion to $9.8 billion per year. According to all these reports, if the Jones Act did not exist, then neither would the public debt of Puerto Rico. This is not just about recovering from Hurricane Maria. It is also about Puerto Rico’s long-term future. If the Jones Act were suspended, consumer prices would drop by 15 percent to 20 percent and energy costs would plummet. A post-Jones Puerto Rico could modernize its infrastructure and develop its own island-based shipping industry. Indeed, the island could become a shipping hub between South America, the Caribbean and the rest of the world. This industry would generate thousands of jobs and opportunities for skilled laborers and small businesses. On an island with official unemployment over 10 percent (but actually closer to 25 percent), this would energize their entire work force.